Berkano (Berkana) is the half-month stave through 30 March. Gebo is the intuitive rune, and Perthro reversed indicates Reason’s message to us. Read right to left is Berkano, Gebo, then Perthro reversed. Tiwaz , am I right? Holy cats, the last two weeks have been a cavalcade of catabolic rewiring and damage control. It’s easy to feel that radical change and want to hunker down, to retreat. In truth, a fine balance of self-care and self-challenge is what’s called for. I don’t know about everyone else, though this year’s experience of Tiwaz has been gutting. We’ve had to face unfinished business and bring to it the skills we’ve cultivated, all while processing the emotional burden of the moment and of the past, and of the uncertainty of how to move ahead. It’s not easy stuff. It was never meant to be. I’ve always marveled at how the Futhark knows what’s needed when, particularly as we work with it in a seasonal progression, but also just in general. 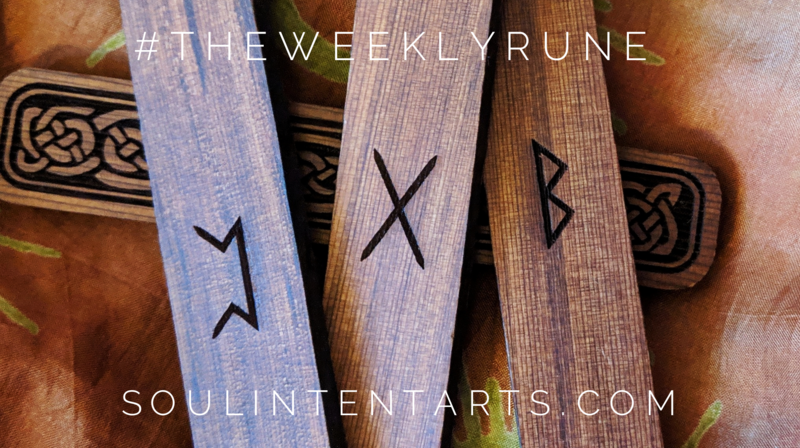 When randomly pulling runes for specific intentions–it just knows. I think that’s why I’ve always been so very fond of Tiwaz, because no matter how caustic it can be, at least it’s followed by Berkano. 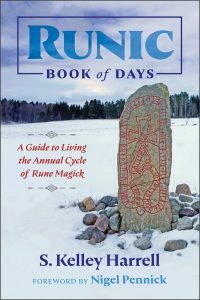 Berkano refers to a tree, different ones depending on the various translations of the rune poems. What emerges from those translations is a spirit of resilience and care that is adaptable and capable of sustaining. The narrative therein touches on having healthy boundaries and self-care rituals, all of which are as much survival skills as those in the battle of Tiwaz. Berkano brings soothing salve for the wounds dealt from Tiwaz, and really, all of the wounds sustained or realized up through this point of the Futhark’s progression. It is the first deep pause in the Futhark that is purely based on our self-care. It’s not about celebration or planning. It’s not about assessing or reviewing. It’s about being right here in the moment, giving what’s demanded, not looking forward or back. Recovery requires a combination of literacy and skills to bless where we are, what we’ve been through, what we need, how our needs have been changed by this shift, how we provide foundation for the moment, and the motivation to be the moment. We are not required to live beyond the moment. We’re not even required to see beyond the moment. What’s on the plate right now is to take the time to let any processes happen that need to, hold the space for purging and shifting, create stability in the mundane for those to happen, and call on the Dream Team for support in doing so. I really do think that’s what Gebo points to as the supporting rune in our cast. It hints at both enlisting others to help right now, but also at the partnerships that can result from reaching out at this time. None of this recovery happens in a vacuum. We can neither do it alone, nor were we intended to. Likewise, we can’t get the most beneficial results to all of this ordeal alone. Therein lies the rub. While Berkano carries this nuance to slow down and realize the fullness of the moment focus, it also has an edge of not being too emotionally involved with the moment. Don’t slow down so much that we lose steam. Don’t hold the moment so fully that we’re paralyzed by its force. Most of us can’t hold that finessed boundary alone. We need to turn it over to trusted others who have the emotional distance required to embody the change, yet process the scars of molting. We’re not supposed to be an all-in-one deal. We’re supposed to enlist others with the skills to help us. Now’s the time. If I’m totally honest, I paused on Perthro reversed, though when I sussed it came from the voice of Reason, I felt better about it. Perthro, as-is, tells the tale of things being beyond our control. It’s the reminder of the unknown and unknowable that we must make peace with. When upheaved, its nuance is more along the lines of, “Things are unknown; what are you going to do about it?” Reversed, its focus is how we respond to that fact, how we cope with the way it makes us feel to relinquish control, and to realize we have to still go on. This week we are allowed to take a breather, but it has to be a real breather. We can’t rush process for the sake of expedient suffering. We can’t offset the process to a trusted ally. Ain’t no bypass here. This week, we have to really take care of ourselves.